Like many young adults, I enjoy reading BuzzFeed lists. This one, hands down, is my all-time favorite. (I based who I like in the show entirely off of my favorite soccer team). So, in honor of my favorite list of all time, I’m going to make a list just for you about website redesigns – it probably won’t be quite as thrilling as watching Game of Thrones or an exciting soccer matchup, but, I’m going to give it my best shot. When it comes to the website redesign process, many companies and business owners jump in, claiming they ‘need’ a new website, without having a plan for that site, or knowing what they want to accomplish. 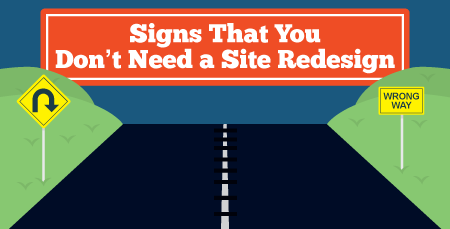 Without further ado, here are Five Signs You Don’t NEED a Site Redesign. Before going right into the process of redesigning and redeveloping your website, I highly recommend you take a look at your current site, figure out exactly what you’re looking to accomplish, and talk to a web development professional about what you can accomplish with your current website. Can you make some minor tweaks? Do you need a redesign, or do you need to build an entirely new website from the ground up? In many cases, with some development tweaks and a little polish, you can bring your current website up to snuff and create something that you and your customers will really enjoy – and you’ll be looking at a bill of a few hundred dollars, compared to thousands. A lot of times, modifying your existing platform – updating your version of WordPress or Drupal, adding plugins to that for certain tasks to make things faster, more secure, etc. – can give you the look and feel of a new site at a fraction of the cost and time. This isn’t guaranteed, by any means – if you have a very old platform, you’re using a legacy platform nobody has ever heard of, or you’re looking at so many changes and adjusts that it’s approaching the cost of a new site – then it’s likely time for a full redesign from the ground up. But explore your options first and talk to your web development and web marketing professionals – you could save yourself a lot of time and money by exploring your options. Managing a website redesign is no easy task. We have an entire blog post dedicated to talking about a website moving team which you can (re)read here. The short recap: redesigning and building a website that’s successful and helps your business succeed is not a one-man show. It takes talent and coordination from a number of people who hold a number of different skill sets and have the time as well as the energy required to dedicate to the design process. In most cases, you’ll be hiring an outside vendor for the development and design of your website, but it’s still going to require a lot of action on your end – working with the developer, giving feedback on design, reviewing requirement lists, reviewing strategy and goals for the website, etc. If you want to keep your rankings and sweet, sweet, link equity, you’ll be spending a lot of time with your digital marketing team as well. And if you’re part of a larger company, you’ll be communicating this up the chain and meeting with your other internal teams to talk about the process. Even with outside vendors doing the heavy lifting, there’s a huge investment of time involved for those looking to redesign their website. The amount of time you spend on this project will be dictated by many factors – the size of your team, the scope of the redesign, etc. – but be prepared to spend a large chunk of time working on this process. Would you hire the cheapest possible contractor to perform repairs or additions to your home? The cheapest mechanic for your car? Maybe, but if you skimp on the upfront cost and hire someone who rushes through the job or lacks the necessary skills to get it done, then you’re setting yourself up for a lot of aggravation and expensive repairs down the line. The same can be said of web development – although, part of the issue here is that it runs such a wide spectrum. Working with a freelancer is often one or a few thousand, small web design firms can run from a few thousand to five figures, large web firms can approach $25,000….it just keeps going onward and upward. Start with establishing what you need to actually accomplish and get quotes for services to get an idea of the general price range you’re looking at. Keep in mind the more complex your project is – if you need specific functionality that isn’t standard, if you need to restructure hundreds of pages into menu, etc- your cost is going to climb. I’m not advising you throw money into the well like it’s nothing, but a website design is not the time to cheap out on things. Get an idea of your budget, what your wish list will cost, and work with a vendor who backs up their work and has examples of similar work to show you. “Oh sweet. I spent like four weeks of my time on this website and paid the web development guy. Guess I’ll sit back and watch the money roll in.” Here’s a sign for you: First of all, you spent all this money and time building the website and then you’re just going to sit there?! Your new website is a chance to gain more customers, to improve your marketing efforts. You have a way better foundation to build on, so start doing something with it. Blog more, run A/B tests, write new pages, try to improve your rankings – do things with this website. Second – something will probably go wrong. There will be housekeeping. Andy at Orbit Media has a great list of how to relaunch a high-ranking website. Post launch, you need to update sitemaps, verify Google Analytics, ensure everything is being indexed properly, and more. If you’re into that whole crazy SEO business, you’ll want to keep an eye on your keyword rankings and make sure your links are being redirected properly. Prepare to spend some time post-launch to make sure the wheels are in motion properly. One Easy Trick to Make Web Developers HATE You! Every redesign should begin with a list of requirements, complaints about the current site and things you’d like to see improved. If all you can list is “make it look better” then guess what – you’re not remotely ready to jump into this process. Also falling into this area is unrealistic timelines and expectations. Website redesigns typically take 4-6 weeks – so you need to plan ahead. You can’t call someone on Monday and have a new site by Friday, unless you have the most basic of websites. Your new website is not going to take you from 2,000 visitors/month to 10,000; you won’t rank #1 for a super competitive keyword. A new website provides a better platform for growth over time and a better conversion rate of visitor to customer, but it’s not going to pour rocket fuel onto your results. I hope this post provides a bit more insight into what’s required of the website redesign process and helps you determine if you’re ready to embark on the adventure of website migration. It’s time consuming, expensive, and will zap your energy – but can pay big dividends in the long run. Take the House Tyrell / Manchester City approach to website migration – grow strong and play the long game. Be prepared, and the whole process will be way easier. Next Next post: Do Meta Descriptions Matter for SEO?